No matter where you go for violin lessons in Toronto – or anywhere for that matter – having the right sized violin is essential, especially for children. If you don’t want to buy a violin every one to two years, then you can rent violins from Elite Music for less than the cost of your daily latte. The first two months of rentals are free for anyone just signing up for violin lessons. Even if you would rather purchase a violin for your child, buyer beware! There are many retailers around Toronto who have significantly overpriced these instruments. Shop around to make sure you get the best deal on a quality instrument. Violins are awkward to handle for new students of all ages and having the wrong size compounds the problem, especially for small hands. Any violin teacher will tell you that a student cannot succeed in their lessons – no matter how awesome their violin teacher is – without the right size. When a student learns to play violin on an instrument that is too large or too small, they are literally learning to play it incorrectly. Even the best violin teacher can’t compensate for this problem. The student will bow the violin wrong, hold it wrong, and have awkward (at best) technique. Even if the sound coming out of the violin is correct, the method used to produce it is incorrect. As an adult, the student would wind up having to unlearn everything they know about using the instrument and start from scratch. Not only that, but an instrument that is too big is usually heavy and ungainly for a small child, making the problem even worse. What Violin Sizes are Available? There are a total of eight standard sizes of violins. Sizes range from full size, or “4/4” to 1/16th of the full size. Giving younger students the opportunity to trade up for larger sizes as they grow. No matter how old the student, they will be able to maintain control of the instrument, reach the neck comfortably, and experience optimal performance. Why Don’t Adults Have to Measure for a Violin? Adults have it easier. The right size is usually pretty straightforward – a full size violin works for almost all adults. Adults who are on the smaller size can often order a 7/8 violin to accommodate their stature more comfortably. Many times this size is also used for teenagers who are just shy of their adult size but find a 3/4 to be too small. To have the right fit for a child, you will need a measuring stick or tape to measure your child’s arm. Have the child extend their arm at a right angle from their body, palm up. Measure from the neck to the wrist for the best size. Some teachers recommend measuring to from the neck to the palm, which will produce a larger violin. Children will grow into the violin, so it is a matter of preference. 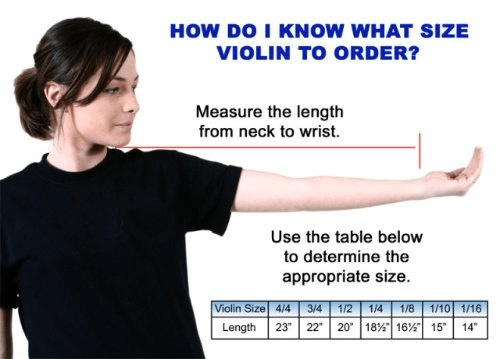 We recommend measuring to the wrist, as promoted by the Suzuki method. This creates the most comfortable playing experience for any child. Use the chart below to compare your child’s arm measurement to an appropriate size. Keep in mind that this measuring is designed to help your child comfortably play violin without the pain of wielding a too-large instrument. In addition to the different sizes of violins, you’ll need to select the right sized bow and case. If you are in doubt, go for the smaller size.If you are not sure, please consult with your violin teacher or one of our staff. We offer one of Toronto’s best selections of violins and are always happy to help our students fit for their violin and select the right instrument.